High School Baseball and High School Softball April 1st vs North Baltimore has been cancelled and moved to Thursday May 9th at 5pm at home. Boys Baseball will be making up their game with Pandora Gilboa Friday April 26th at 5pm at home. Boys Baseball at Columbus Grove Friday April 26th has been cancelled. JV Baseball Friday April 19th at Miller City has been cancelled. The McComb Athletic Department will be holding sports physicals on Wednesday, May 15th, 2019 from 1:00pm-3:10pm for any 6th, 7th, 8th, 9th, 10th or 11th grader at the elementary, middle and high schools who are interested in participating in a sport. The cost will be $10.00. No checks please, cash only. You must have your physical sheets filled out and with you at the time of the physical. You can find the physical forms at the high school office, middle school office and elementary office. All physicals will be held at the high school in the cafeteria. 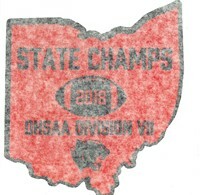 Please bring an OHSAA form with you, with history completed and permission signed by parent/guardian. These forms can be found on OHSAA website under sports medicine or from your athletic director’s office. Please note only OHSAA forms will be filled out at these physicals. All other forms i.e. boy scout, college entrance, etc. need to be filled by your family doctor or our Express Clinic. If you are unable to attend this date, physicals are available from our Express Clinic. Physicals will be available during the summer 7 days a week, 7:30AM – 8:00PM, at a cost of $35. Please call (419)427-3030 to schedule an appt to reduce your waiting time. However, walk-ins are welcome.